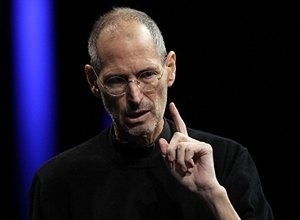 Sony Buys Rights To Steve Jobs Bio | The Cineaste's Lament. ← Ten Female Superheroes Who Need Movies. Sony Pictures has purchased the rights to the rush-to-publication biography of the late Apple founder Steve Jobs. “Steve Jobs” is an authorized biography by former CNN chairman and Time Magazine managing editor Walter Isaacson. The book was originally supposed to be published on Nov. 21 but Simon & Schuster has (not surprisingly) moved it up to Oct. 24. The 448-page profile is based on over 40 interviews with the Apple co-founder and over 100 conversations with friends, family members, colleagues and competitors. This entry was posted in Biopic, Film News, Our Films, Ourselves, roman a clef, Thinking About Movies and tagged Apple Computers, film biography, iPad, iPhone, iPod, iTunes, Steve Jobs, Walter Isaacson. Bookmark the permalink.